Briefly, in 1983, there was even a show called Charmkins. In all of toondom, however, there is probably not a warmer or a fuzzier series title than Kissyfur. Kissyfur was an 8-year-old bear cub. When his mom died, he and his dad, Gus, turned their backs on their former life by joining a circus. They tired of circus life, tho; and took a train derailment in the wetlands of Paddlecab County as their cue to escape. They found it difficult to become a part of the local animal community, tho, until they rescued the others from Jolene and Floyd, a pair of hungry alligators (who became recurring villains in the series). This story was told in Kissyfur: Bear Roots, a half-hour animated special produced by NBC in conjunction with DiC Entertainment (Captain Planet, He-Man). It was based on characters created by Phil Mendez, whose other credits include character design on Ferngully and the 1998 Rudolph the Red-Nosed Reindeer movie. NBC first aired it on December 22, 1985. A second special, Kissyfur: the Birds & the Bears was shown three months later; a third three months after that; and a fourth only one month after the third. The regular weekly series debuted on September 13, 1986. Kissyfur's voice was provided by R.J. Williams (Cavin in Gummi Bears, Kit in TaleSpin) and Gus's by Ed Gilbert (various voices on Freakazoid!, Don Coyote and Pirates of Darkwater). 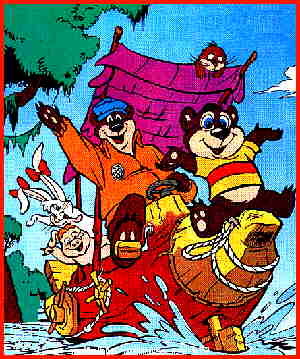 Their friends included Duane, voiced by Neil Ross (Biker Mice from Mars); Claudette, voiced by Frank Welker (Foofur) and Miss Emmy Lou, voiced by Russi Taylor (nephews in DuckTales). Jolene's voice was Terence McGovern (Launchpad McQuack) and Floyd's was Stu Rosen (voice director on the 1989 Pryde of the X-Men). Aside from the four specials, 16 episodes were made for the first season. Then it went on a year's hiatus, and was back for the 1988-89 season with nine new episodes. DC Comics adapted it into a comic book in 1989, but only one issue was published. Kissyfur made enough of an impact to be vividly remembered by anyone who chokes on sufficiently warm, fuzzy cartoons. But it's rarely been glimpsed in recent years. Text ©2003-10 Donald D. Markstein. Art © DiC Enterprises.